The country’s one of the largest auto manufacturers, Hyundai Motor India Ltd., has recently launched the LPG variant of their most awaited small car in India, Hyundai EON. The new Hyundai EON comes with three variants such as Hyundai EON LPG D Lite Plus, Hyundai EON LPG Era Plus and Hyundai EON LPG Magna Plus. The all new Hyundai EON LPG price is tagged between Rs. 2.98 lakh to 3.42 lakh (ex-showroom New Delhi). The all three LPG variants of Hyundai EON are priced around Rs. 27,000 higher. Hyundai EON LPG D Lite Plus is fitted with air conditioning, power steering, gift shift indicator and body coloured bumpers. On the other hand, Hyundai EON LPG Era Plus is also loaded with additional attributes like front power windows and central locking that helps to make it more style and sporty. Apart from that, the highest variant of EON, Hyundai EON LPG Magna Plus also added with a 2-Din audio system with USB, Aux and many more features. The LPG variant of EON is available with factory-fitted separate petrol (32 litres) and LPG (34 litres). The fuel tank capacity of Eon is enough to drive over 1,200 kilometers on a full tank of LPG and petrol. Hyundai EON LPG pictures looks very attractive and amazing that can help to attract more consumers those who are looking to purchase this kind of LPG car in India. The auto giant is already having wide range of popular cars in India such as Hyundai Accent, Hyundai i20, Hyundai Santa Fe, Hyundai Santro, Hyundai Sonata, Hyundai Tucson and Hyundai Verna Fluidic. 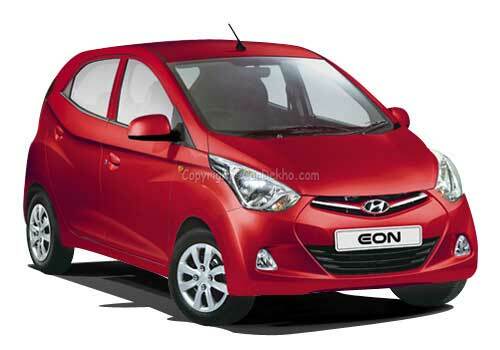 The newly launched Hyundai EON LPG will be getting tough competition with Honda Brio, Maruti Alto, Chevrolet Beat, etc. Hyundai Santro was the first Hyundai small car in India; it also got huge response from the Indian auto market. Very nice looking car! I was wondering if they offer this in left hand drive though. From what I read, this is the only LPG variant for the EON as it is made for India. I am looking forward to performance results based on driving reviews.